It’s been over two years now since I started this beauty of a quilt! It was my first experience with paper piecing and it turns out, I loved it! It took me about 2 months to finish the quilt top and then another 22 months to decide how to quilt it! I’ve had this quilt finished and displayed in my living room now for almost 2 months and finally I’m ready to reveal it on my blog. After studying both of Angela Walters amazing free-motion quilting books I finally settled on a design. I did a large scrolling swirl down one side of the quilt and then did wavy-like flames in each of the points. I did the same scrolling swirl in the piano key border as well. It’s a bit easier to see the scroll design from the back. I pieced the back using flannel and made a label using scraps to imitate the design on the front. I am really proud of this quilt! I put a lot of time into it, and I think it is my best work yet! 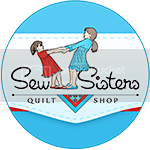 I can’t believe that over 2 months have gone by since I last posted… I always find that the winter is so busy for me and I get most of my quilting done in the spring and summer. I know that is unusual but that’s how it is for me. I have been working on a course for my masters and that consumed a huge amount of time the last few months. Truth be told I haven’t been in my sewing room at all for over 2 months either! Last weekend I broke my sewing fast and went to another Sew Many Treasure weekend retreat. It was so good to be there and be sewing again. I finished my Chicopee kaleidoscope quilt top! My mom and I also made these super adorable chicken pincushions! And finally, also after 2 years, I finished my New York Beauty table topper! Well the top is finished anyways! I’m in the midst of quilting it right now, and rather enjoying making curly-cues and leaves. This was done with “paper-peice by the yard”. It’s a yard of thin muslin-like fabric with the pattern printed on it. The cool thing about this is there is no need to rip all the paper off the back like you normally do, since its actually fabric not paper! I guess that’s the synopsis of the whole winter of quilting! Spring is here in Alberta and so my class is done, work has slowed a bit and I plan to get lots of my UFO’s finished up. That means a whole lot of quilting is in store, so I’ve got out my ER DVD’s to watch while I stitch! OH MY Kerrie! Your quilts just get more and more incredible! WOW!!! LOVE that you are back to blogging. . . your blog always inspires me to head to my sewing room! Love love LOVE your quilt! Congrats on finishing!! Glad to see you blogging again. Love your stepping stones quilt!